Our campsite In Moscow is at the Danilevski Hotel 2 stops on the metro from the Kremlin and in the grounds of the Danilevski Monastery which is the Vatican of the Russian Orthodox Church. It is very quiet – no loud music is allowed here – and the hotel has pictures of bearded priests on almost every wall. We overlook the gardens and one of the churches here, it really is a perfect spot! it can only be booked through Perestroika Tours in advance of arrival and we are very pleased we did this. Its also about 300m from the metro and a western style supermarket which makes you realise why Moscow is the most expensive city in the world when you find crisps and loaves of bread for £5 a pack and All Bran for £10 not to mention the £2000 bottle of vodka! We’ve now been in Moscow for 3 nights and are relieved we’ve allowed ourselves 10 days here. It is very hot – unusually so we are told, and there is an awful lot to see and do. We’ve so far been to a museum workshop to see some modern sculptures by Alexander Burganov which was very interesting though we were the only people there. We’ve visited GUM which wasn’t at all like it was when I came here with my parents in 1972 now being full of designer shops and boutiques with surprisingly few customers. It is still a beautiful building, or more precisely 4 long narrow 4 story buildings running parallel to each other covered with a beautiful arched glass roof. One thing I remember with affection from my childhood visit was the drinks machines on Red Square. These were very popular with Russians and had a glass which you washed out and then put into a little hole, inserted a coin and a fizzy drink was dispensed. You drank it then washed your glass and put it on top of the machine for the next customer. Rather unsurprisingly these are no longer here but GUM has little carts serving fizzy flavoured water which we told was the same. There is now a choice of flavours (all mixed like a sodastream) from bar like optics and each flavour is in a different primary colour. I went for green which we were told was the original flavour (though I can’t remember the colour from my visit) and it did indeed taste like the drink I remember! Linda wasn’t impressed, though I suspect this had more to do with the colour and the fact that in her mind anything coming from an optic should by rights be alcoholic. Its been a festival day on Monday celebrating the parachute divisions and Moscow was crowded with ex-soldiers dressed in blue and white striped vests, that often failed to cover their beer bellies and their berets waving flags and in various states of inebriation from tipsy to completely drunk. They’ve not been any problem to the tourists but the soldiers at the eternal flame had to point their guns at them to get them to climb down from the monument and the police have looked extremely intimidated, especially the group of police who challneged a small group of raucous soldiers who promptly produced a Kalashnikov! It’s actually quite fun to watch as the police usually have an arrogant swagger and look at times a bit SS like in their high peaked caps but we decided we’d not be in the city for the evening as even by mid morning some of the parachutists were wanting to take on the armed soldiers in fights. We instead headed off to the sanctuary of the Cathedral of Christ our Saviour, a rebuilt copy of the original blown up by Stalin in 1931 to make way for the Palace of the soviets. The palace was started but war saw work stop and it never recommenced eventually being turned into the largest outdoor swimming pool in the world. The palace would have been 400m high with a 100m statue of Lenin on top and gigantic. Its small hall would hold 6000 and the large one 25000! It is ironic that all of the stalinist skyscrapers that were built around the city – they resemble the building in ghostbusters – now face the new cathedral and not Lenin! The church itself is masive and has a large gold dome in its centre. Its based on the Hagia Sophia and inside its use of gold is breathtaking. Underneath the churcb is another huge church again with plenty of gold but more frescos on the walls and ceilings. In front of the cathedral is a new pedestrian bridge that crosses the river Moskva and is a favourite place for wedding photos with the cathedral in front of you and the Kremlin to your right. Weddings move from here Further up river toward the Kremlin and another foot bridge which is lined with small metal trees. These trees are bare branches with no foliage just hooks through the branches where couples place a padlock with their names and wedding date on as the leaves. The trees look wonderful with the multitude of shapes colours and sizes of padlocks on them and there are about 20 trees in all. We’ve also been for our obligatory Indian where we were told that corruption here is still a significant problem but the Mafia has all but vanished. We’ve been to the Red October Chocolate factory which is now a complex of bars apartments And restaurants with sadly not a chocolate to be found anywhere and walked for miles and miles gazing at the architecture everywhere. We’ve seen the enormous statue of Peter the Great hanging on to the rigging of a ship Peter Pan style (which we thought was Columbus at first) and visited numerous churches. 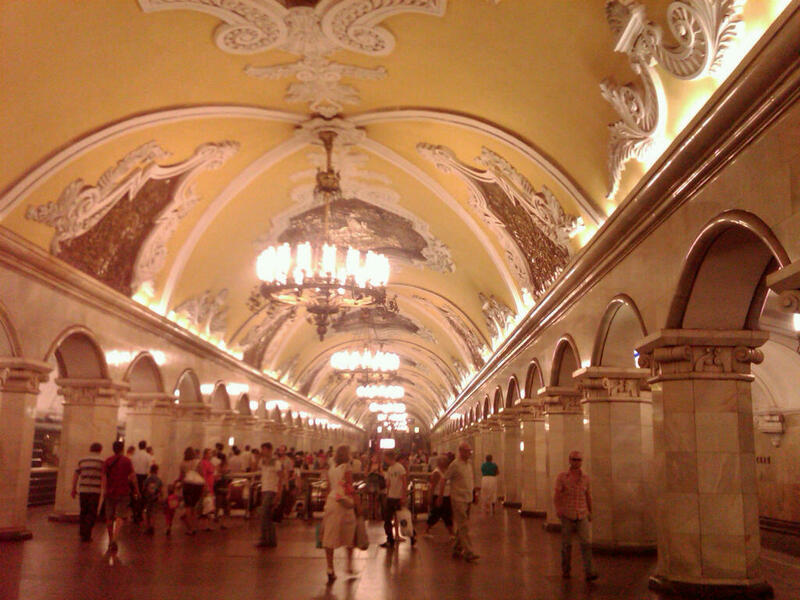 And of course there is the metro, a fabulous monument in its own right it is functional and beautiful too with numerous stations being worth a visit for the statues, stained glass windows, chandeliers, mosaics or the grand patriotic themes. Our journeys are often broken by us having to hop on and off at a station for a quick look around before continuing on our way! We’ve only been here 4 nights and have another 5 to go but we already feel we need more time here to do everything!